Journal Journey and Joy! : Catalonia to hold independence referendum next year. 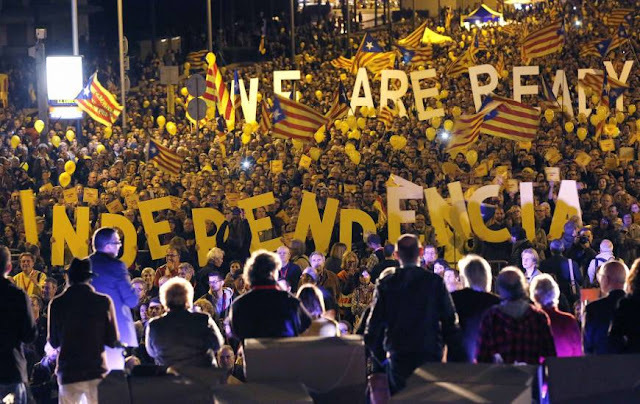 Catalonia to hold independence referendum next year. Catalonia will hold a referendum on independence from Spain next year whether or not the central government in Madrid agrees to one, the region's head Carles Puigdemont said on Wednesday. In Catalonia, They have done an unofficial referendum already in 2014, at that time, 80% people are positive for independence. Catalonia has a history of oppression from Spain. In additional, recently there is the unequal distribution of wealth. Spain should solve the problem at first, before claiming that the independence referendum is unconstitutional. UK's former prime minister Cameron accepted the Scottish referendum in 2014, then he did a "remaining campaign" at last remain side won. Spain should also accept the referendum like the UK, then Spanish government argues confidently "Why should Catalonia stay in Spain." This is a valid way to solve the Catalan independence movement. Otherwise, Catalan's problem grows every year.